Cannabis, its preparations, derivatives and similar synthetic preparations are classified as Schedule II controlled substances in Canada. Unlawful possession is a criminal offence. 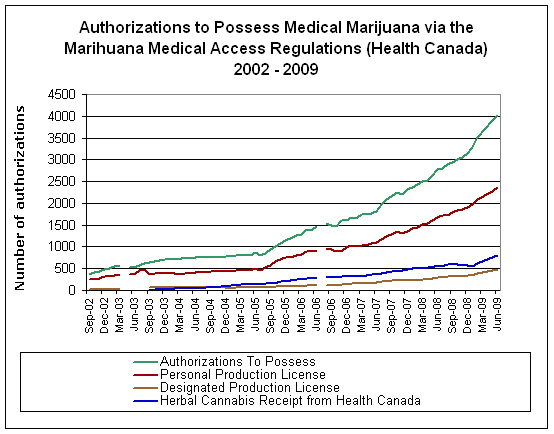 In 1999 Health Canada implemented the Marijuana Medical Access Regulations (MMAR) to allow the access to marijuana to people who are suffering from grave and debilitating illnesses. The MMAR deals exclusively with the medical use of marijuana and not the issue of legalizing marijuana. 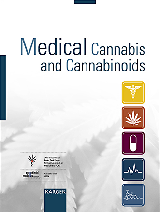 The MMAR, revised in 2005 following criticism from patients and other stakeholders, allows authorizations to possess dried marihuana as well as licenses to produce personally or designate someone to produce. Authorized individuals also have the option to receive standardized marijuana from Health Canada (%12.5 THC) at a cost of $5 CDN per gram. The MMAR specifies maximum amount an authorized individual may possess (a 30 day supply) and the number of plants allowed if granted a production license. There are two categories of people who can apply to possess marijuana for medical purposes. Category 2 is for applicants who have a specialist confirmed diagnosis with debilitating symptom(s) of medical condition(s) other than those in Category 1. Throughout the past 20 years many marijuana related cases have been before various Canadian courts. In 2000, the Ontario Court of Appeal provided the government one year to enact an effective and meaningful medical program. In 2001 the Medical Marihuana Access Regulations were enacted and immediately a constitutional challenge was brought to some of the restrictions imposed by the regulations on eligibility to enter the program and access to medical marijuana. In 2003 the Ontario Court of Appeal invalidated a number of restrictions including the requirement that some patients secure the approval of two specialists, and the rule preventing a designated producer from growing marijuana for more than one patient and preventing the grower for charging for his/her services. Within 3 months of this decision Health Canada lifted the prohibition on charging patients for medicine but re-enacted the prohibition limiting the grower to working for only one patient. In 2008-9, both the Federal Court and the British Columbia Court of Appeal invalidated this re-enacted restriction on designated producers on the basis that this restriction constituted an arbitrary limit on patient’s rights. In 2009 Health Canada responded to these cases by amending the regulations to permit a grower to produce medicine for two patients. Currently, there is a great deal of opposition to designated production arising from police forces and fire departments who believe that many of these production facilities are unsafe and present fire hazards. In addition, the alternative to designated production (i.e. purchasing marihuana from the government contractor) has also been criticized by patients who believe that the medicine being produced by the government contractor is of poor quality. In fact, less than 20% of authorized patients in the program purchase their supply from the government. It is anticipated and expected that further constitiutional challenges will be brought on the current regulatory restrictions imposed upon supply and access. Canadian doctors are becoming increasingly comfortable with prescribing cannabinoids, mostly off-label for pain and psychiatric conditions. 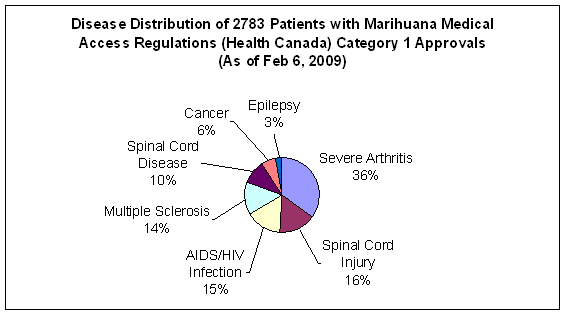 There are three prescription cannabinoid preparations available in Canada. Nabilone (Cesamet ®) – indicated in adults for the management of severe nausea and vomiting associated with cancer chemotherapy. 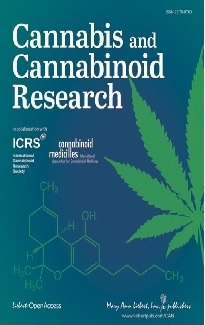 THC:CBD (Sativex ®) – indicated as adjunctive treatment for the symptomatic relief of neuropathic pain in multiple sclerosis in adults, and as an adjunctive analgesic treatment in adult patients with advanced cancer who experience moderate to severe pain during the highest tolerated doses of strong opioid therapy for persistent background pain. 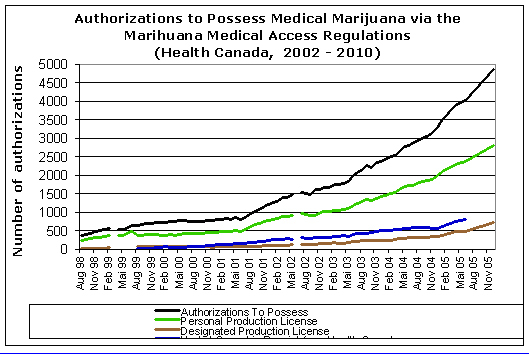 As of January 2010 over 4000 Canadians were authorized under the MMAR (see Figure 1). It should be noted that over 2000 Canadian MDs have signed MMAR authorization forms on behalf of their patients. See figure 2 for a distribution of category 1 authorizations by disease. No data are available on category 2 symptoms or diseases.